The KTM 690 Enduro R is the most reliable bike I've ever owned...except for one major flaw! And I owned a KLR so this is a bold statement, I am aware. Justification required and it follows. Starter Motor at 18k miles - this probably isn't worth mentioning because I am pretty sure it had a lot to do with a mechanic "servicing" it at 17k miles. Everything else! That's a big deal to me. If you think about it, it's crazy that after 25 thousand hard miles of on and off road, dozens of crashes and all kinds of weather everything is still performing as new. The suspension, the clutch, the electronics, the brakes, the fuel pump and all the components. No plastic tabs or screws have broken. No bits have worn out from constant maintenance. No dents or bends in the rims. No loose spokes. Not a single screw has even vibrated off. And even with all the crashes, nothing has broken or needed repair. What's also amazing is that I'm still on the original front brake pads! Here it is: KTM isn't open and honest about the maintenance required for this bike. KTM has designed a pretty stellar bike. There are no other adventure focused bikes like it...300 lbs, 70 hp, durable, capable, fun, runs on crap gas, 5k mile service intervals, etc, etc. In addition, it's very well engineered and a joy to work on. Simple, with dirt bike ergos and just an all around great bike. However, there are some maintenance issues that KTM needs to come clean about. Doesn't take long looking at the forums to notice people are pretty vocal about these issues but you won't hear about them from KTM. Even when you have the issues and talk directly with KTM USA as I did they won't acknowledge these issues as being systemic. 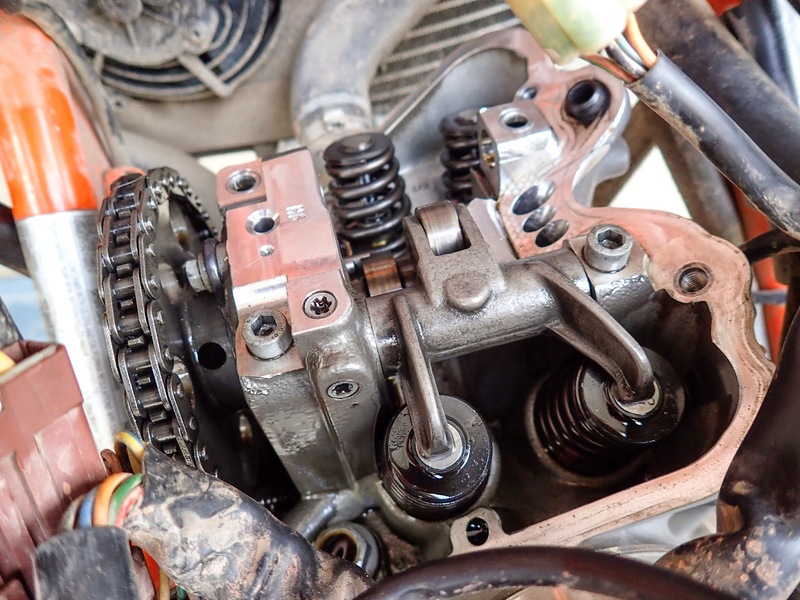 For example, the rocker arms fail between 15k and 20k miles. They just do...they wear out...for everybody. Now I understand it would be hard for KTM to tell potential buyers of this bike that an engine component will need to be replaced every 20k miles. But they need to and if they did, I'd still buy the bike. The up side is that they are really easy to get to, not too expensive and easy to swap out. All KTM has to do is tell customers to replace the rocker arms and water pump seals every 20k miles. As well as anything else I haven't discovered yet and then they will have the most reliable bike I've ever owned. In the defense of the KLR, the year you got was known for gremlins. The older ones are stone reliable, albeit not as fun or powerful as the KTM. My KLR aside everyone I've met down here on a KLR has had many different issues as well. Update: Another rocker arm failure at 7500 miles. This time I think it was due to the water pump seals failing and my oil being thinned by my coolant. Time will tell. These rocker arm failures are a little crazy. Will need to check every other oil change. my 690 smcr 2014`s intake arm break into peaces on 17,5K kilometers. The same thing on Enduro R here on 23K kilometers. Need to inspect arms every 15K+- kilometers and have a couple of arms in your garage for redundancy reason. P.S. one little peace of intake arm I`ve not found "opens" my generator stator like a tin can on millage 21,5K+-.